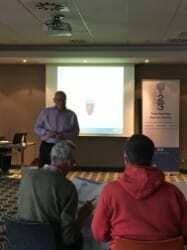 Cricket Leinster held a Fundraising Masterclass last Wednesday 22nd of February in the Talbot Hotel Stillorgan. 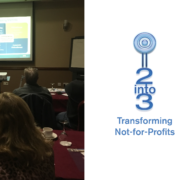 This masterclass was facilitated by 2into3 Consultant Amy Power, a specialist on fundraising strategy development. The event was very well attended, with over 20 representatives from 13 Cricket Leinster clubs present. The masterclass was opened by Paul O’Sullivan, CEO of Clann Credo, a not-for-profit organisation that provides community loan finance at affordable interest and repayment rates to community groups and sports clubs. Recently, Clann Credo announced a €10 million community sports fund to help community groups access sports grants and funding by providing them with community loan finance. Clann Credo do not require person guarantees for loans, while also not penalising early repayment. You can read more about Clann Credo here. Participants were then provided with an in-depth look at the private investment landscape, looking at the role of philanthropy and sponsorship in the sport sector. The theory behind best practice was initially explained before clubs were shown what they can do for themselves. This included applying for Section 235 status. Under Section 235, approved sporting bodies can apply for tax relief on donations for approved capital projects. The masterclass also covered ways of building relationship-based fundraising. Participants worked on ways of building a fundraising strategy, setting goals and knowing your member base. Almost every club highlighted youth development, subs collection and the acquisition of new equipment as priorities going forward. Issues around these points included lack of a suitable database, possible donor fatigue and limited finances resulting in short term year-to-year ambitions. Clubs were urged to look consider the following when approaching these issues, use events as a means of networking for new volunteers and potential donors, developing an adequate fundraising mix, using a dedicated database to contact past members and to be ambitious in developing long-term targets for the club. Feedback of the event has been very positive, and will no doubt help Cricket Leinster clubs prioritise their fundraising strategies in the coming weeks and months. Furthermore, Leinster Cricket is partnering with 2into3 to assist Clubs secure funding under future sports capital rounds. If your organisation you would like to learn about how 2into3’s expertise can help in the funding of sport via Fundraising Masterclasses please feel free to contact 2into3 Consultant Amy Power via Amy.power@2into3.com or on 01 234 3165. 2into3 are delighted to have assisted 4 of our clients in the 2017 Sport Capital Programme Grant round. Since 2014, 2into3’s consulting practice has assisted clubs across a range of sports to secure funding. YMCA Hockey Club: in association with Wesley College: Awarded €150,000 towards resurfacing of the main hockey pitch at Wesley College, Ballinteer, Co Dublin. Loreto Hockey Club: in association with Loreto High School Beaufort awarded €150,000 towards resurfacing of the hockey pitch at Loreto High School, Rathfarnham, Co Dublin. Fr. Mathew’s Basketball Club, Cork: Awarded €59,000 towards provision of two portable basketball courts. Monkstown Hockey Club: In association with Rathdown School awarded €19,000 towards provision of Hockey Goals and renewal of fencing. The State, via the Department of Transport, Tourism and Sports, uses the National Lottery Funds to support capital investment by both National Governing Bodies and Sports Clubs through the Sports Capital Programme. A call for funding is usually made each year and funds are allocated by County. The 2017 round of the Programme closed for applications on the 24th February 2017 and by that date a record number of 2,320 applications were received. €56m was then allocated to over 1,700 different sporting projects. Just over 1 in 5 applications were deemed invalid (21%) with many applications falling down on avoidable issues. In addition to working on a 1-2-1 basis with clubs 2into3 also work with National Governing Bodies. To help inform clubs on the Sport Capital application process 2into3 have developed a Sports Capital Masterclass. 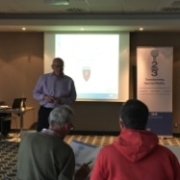 2into3 have recently delivered a Sports Capital Grant Masterclass and Fundraising Masterclass to member clubs of Cricket Leinster, a partner organisation of 2into3. Attendants were given an in-depth look at the Sports Capital landscape, looking at the performance of cricket compared to other sports, while also analysing the performance of Cricket Leinster clubs. Clubs were shown the common pitfalls of Sports Capital applications, while also examining the necessary steps to strengthen a grant proposal. As part of the Fundraising Masterclass participants were then provided with an in-depth look at the private investment landscape, looking at the role of philanthropy and sponsorship in the sport sector. If your organisation is considering applying for a grant in the next Sport Capital Programme funding round (2018) and you would like to learn about how 2into3’s expertise can help, please click here or feel free to contact Dennis O’Connor directly via dennis@2into3.com or on 01 234 3184. Leinster Rugby and 2into3 recently held a Sports Capital Masterclass on Thursday 30th of May in the Red Cow Moran Hotel. 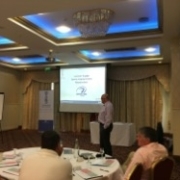 This Masterclass was facilitated by Dennis O’Connor from 2into3, a specialist on the Sports Capital Programme. The event was very well attended, with 24 representatives from 19 Leinster clubs present. Attendants were given an in-depth look at the Sports Capital landscape, looking at the performance of rugby compared to other sports, while also analysing the performance of Leinster Rugby clubs. Clubs were shown the common pitfalls of Sports Capital applications, while also examining the necessary steps to strengthen a grant proposal. Several myths about the Sports Capital Programme were debunked, giving attendants greater clarity going into the next Sports Capital round. We hope that this will lead to a higher application and success rate for Leinster Rugby clubs in future rounds. 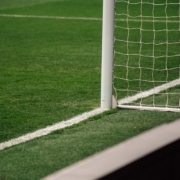 2into3 also provide a 1-2-1 sports capital consulting service where we assist clubs, voluntary and community groups, local authorities, third level colleges, and education and training boards with their application. They assist at every step of the process, helping you understand your targets, improve your scoring and avoid common pitfalls which may lead to invalidity. For more information please contact Darren McMahon at 01 234 3127 or darren.mcmahon@2into3.com. 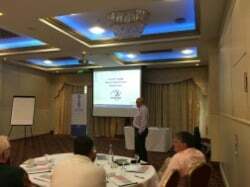 The Munster Cricket Union and 2into3 recently held a Sports Capital Masterclass on Thursday 10th of June in the River Lee Hotel, Cork. This Masterclass was facilitated by Dennis O’Connor from 2into3, a specialist on the Sports Capital Programme. During the Masterclass workshops the areas of school and university sharing, attaining licence agreements and level of own funded needed for a Sports Capital application. Attendants were given an in-depth look at the Sports Capital landscape, looking at the performance of cricket compared to other sports, while also analysing the performance of Munster Cricket clubs. Clubs were shown the common pitfalls of Sports Capital applications, while also examining the necessary steps to strengthen a grant proposal. Attendants were provided with more clarity which will help clubs with future applications. We hope that this will lead to a higher application and success rate for Munster Cricket clubs in future rounds.